Choosing the perfect summer camp for your child can be a frustrating chore. I spent hours this week trying to figure out which camps would meet my kids needs, mesh with our busy schedules and fit within our budget. In an effort to help other parents find summer camps for their children we’ve put together a list of Summer Camps in Cincinnati & Northern Kentucky for Summer 2016. We hope this helps you find something wonderful for your children! Keep checking back, we’ll be adding to this list as summer gets closer and we hear of more camp opportunities. 1028 Scott Boulevard, Covington, KY 41011 in the Eva G. Farris Education Center Ages 7 to 15 Camp Carnegie 2016: 2-D to Life ~ Bring local art to life on stage in Camp Carnegie 2016: 2-D to Life. Revisiting last year’s popular theme, students will once again create stories inspired by the work of local artists. As a group, students will imagine characters and settings, devise plot lines and conflict, and awaken their chosen artwork through live performance on the Otto M. Budig Theatre stage. Camp Carnegie includes performance, hands-on art making, character and costume design, dramatic exercises, writing, brainstorming, team building, problem solving and a great deal of fun. Each camp session run 3 days per week for 2 weeks (total of 6 days). Read more about these awesome camps in this post. The Children’s Theatre of Cincinnati 4015 Red Bank Road 6 to 9 and 10 to 13 Calling all theatre beginners! Join The Children’s Theatre of Cincinnati for our one-week-long, themed summer camps! No audition required. Our three camps in June offer day-long training and enrichment in acting, dance, and voice, with professional teaching artists as instructors. Sessions are available for 6 to 9-year olds and 10 to 13-year olds each weekday from 9:30 AM to 4 PM at our brand new facility in Hyde Park on Red Bank Road. Register now! Sessions will fill up fast! Only 30 participants will be accepted in each age group for each week. TCT Theatre Camp deposits are due at the time of registration. You can receive a full refund up to June 1 if we can fill your spot. If we cannot fill your spot, we will keep your deposit. After June 1 refunds are not available. Week One, June 6-10, 2016 • Ages 6-9: Heroes and Villains • Ages 10-13: Good vs. Evil – Opposing Forces Collide! Week Three, June 20-24, 2016 • Ages 6-9: Fairies and Wizards • Ages 10-13: Magic, Musicals and More! Cincinnati Museum Center 1301 Western Ave, Cincinnati, OH 45203 Kindergarten – Eighth Grade Explore science, technology, history and the arts through creative, hands-on activities and games at Cincinnati Museum Center’s fun and educational Museum Camps! ~ The Zoo offers children summer camp experiences like no other where they can learn all about the animals and zoo operations. 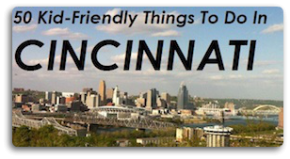 Visit the Cincinnati Zoo website for more details. Circus Mojo 400 Linden St. Ludlow KY 41016 7-17 Circus Mojo is a youth and adult circus arts program where physical skills such as juggling, balancing, and stilt walking coalesce with creative expression such as improvisation, character development, and group performance. In this multidimensional program, combining artistry with athleticism, students conquer doubt and learn a varied skill set in a collaborative, non-competitive environment. Our mission is to teach and present the circus arts with a fresh perspective and encourage everyone to express their unique mojo—talent, zeal, conﬁdence, drive, and spirit. Florence United Methodist Church 8585 Old Toll Rd, Florence KY 41042 Entering 2nd – 6th grades Kids will sing, act or dance while learning God’s message for their lives. Performance at the end of the week. Florence United Methodist Church 8585 Old Toll Road Florence KY 41042 3 years old (by July 11 and potty trained)- entering 6th grade FREE Half day VBS. Cave Quest: Where children learn to follow Jesus, The Light of the World. Includes daily craft, snack and games. End of the week program for parents and grandparents. Open to children of all faiths. Great Parks of Hamilton County Children ages 2–17 can explore nature through hands-on activities, hikes, games, crafts and much more with full and half-day camps. Offerings include two-day to week-long nature, adventure, farm, fishing and horse camps. Newport Aquarium Camp WAVE Summer Camps ~ Learn more about sea creatures with many hands on fun activities! Visit the WAVE website for more details. Sunrock Farm 103 Gibson Lane Wilder, KY 41076 (Near NKU; only 10 minutes from downtown Cincinnati) Ages 4 – 11 Animals, Animals Animals! That’s what many children like best and remember most about Sunrock Farm’s Summer Camps. Children learn the wonders of the natural world while being safely guided by our mature, professionally trained staff. Campers get to milk goats, work with horses, bottle feed baby animals. gather eggs, hold baby chicks, plant/harvest vegetables, make farm-to-table treats, explore the creek and woodlands, play games, and make natural crafts. Trinity Episcopal Church in Covington ~ Reading Camp for students struggling with reading. Visit the Trinity Episcopal website for all the details.